Small and moist, red potatoes are ideal for potato salads, soups and stews. 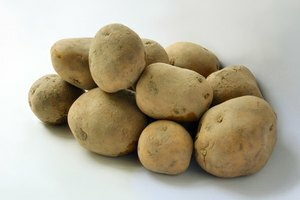 However, like all potatoes, red potatoes are vulnerable to a variety of different factors that can cause them to spoil. Whether raw or cooked, red potatoes will last longer when stored properly. 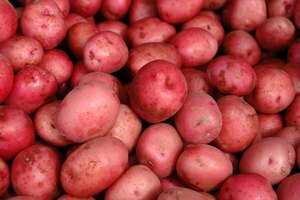 Clean red potatoes before storing them; this may mean brushing off soil or washing them. If you're washing the potatoes, let them dry before putting them in storage. Whole raw red potatoes need to be kept in a cool, dark, humid environment. 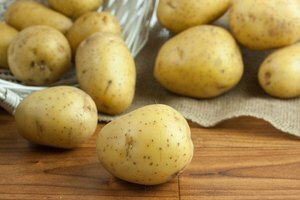 Potatoes are highly sensitive to the environment they're stored in. 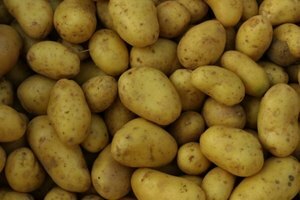 Exposure to light will release a chemical called Solanine, turning the potato green and spoiling its flavor. Too much heat will increase the risk of your potatoes sprouting. On the other hand, not enough heat can cause the potatoes to darken when fried and sometimes taste slightly sweet. If the storage area is too dry, the potatoes will dry out and can become wrinkled. The ideal storage environment is a dark, well-ventilated area with a temperature between 42 and 50 degrees. Store potatoes in an open container such as an open bag, a basket or a vegetable storage rack. Spread the potatoes out to minimize contact between them. Under these conditions, they can last up to three months. Unlike whole potatoes, sliced or peeled potatoes will go bad very quickly. 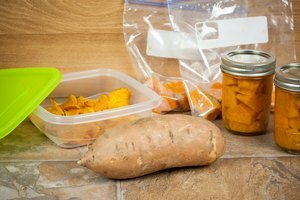 You can peel potatoes in advance and store them in a sealed container of cold water in the refrigerator to keep them fresh; however, you should still cook them within a day. If you have leftover cooked potatoes, you can refrigerate or freeze them. Refrigerate potatoes within two hours of cooking and keep them for up to two days. Don't leave cooked potatoes out at room temperature; this can lead to the risk of botulism contamination, especially for foil-wrapped baked potatoes. Cooked potatoes can be frozen indefinitely, but for best quality you should eat them within ten months to a year of freezing.